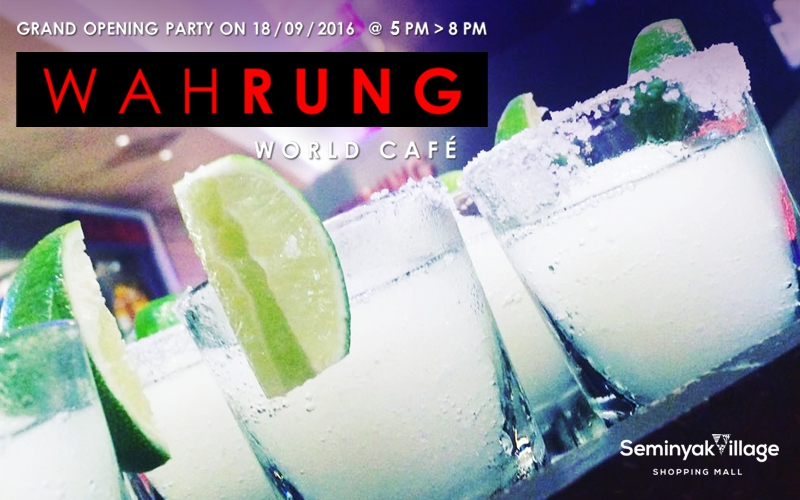 The awaited grand opening of Seminyak's newest favorite, WAHRUNG! WAHRUNG's owner, Louis Wah, is famous for his delicious, high quality burgers that he offers in several creative renditions. The restaurant has also been serving hearty sandwiches, chocolate desserts and French pastries along with cups of boutique coffee and tea for 10 months now and will be hosting a Grand Opening party on the 1st Level of Seminyak Village where they are located. Freshly-made signature dishes in bite-sized yumminess will be served alongside the latest addition of frozen margarita shots on the menu. That's right, FREE-FLOWING DRINKS AND TAPAS ALL AROUND! Plaga wine will be sponsoring red and white wine as well as sangria, and set up a wine counter that offers a Buy 1 Bottle get 1 Bottle Free. 5 Lucky Draw Vouchers of 2,000,000 IDR is at stake to dine at WAHRUNG or WAHWAH BURGER + 3 winners for Best Picture post on Instagram!